Se você reservar entre janeiro e abril de 2019 para datas entre esse período, receberá um desconto de 20%. Uma villa de 3 quartos elegantemente exclusiva - dormindo 8 adultos confortavelmente com a adição de uma cama de berço para um bebê. Vistas deslumbrantes sobre o mar, localização deslumbrante, tudo dentro de um cenário de encosta tranquilo que possui uma piscina compartilhada de luxo. Apenas 5 minutos de carro da praia e várias cidades e vilas italianas clássicas. Taxa de limpeza padrão de 70 Euros a pagar ao agente Yvonne ou a um local de limpeza mais limpo no momento da chegada. Este montante NÃO está incluído na cotação que você pagará pela reserva. Há dois banheiros, um convenientemente no banheiro, piso térreo, com cabine de duche, WC, bidé e lavatório. 1º piso do banheiro tem uma cabine de duche duplo, WC, bidé e lavatório. Nota - secador de cabelo unisex é fornecido. Toalhas de banho fornecida. This was one of our best Holidays we ever had. The Villa was lovely. So beautiful. For us it was the perfect place to relax and forget about the rest of the world. The Villa is very beautiful from inside and from outside. We loved the big balcony and verenda from which we had a spectacular view over the sea and the cost. From inside the Villa is also beautiful, functional and has everything you Need for living. We loved it and we stayed one week extra. The contact to the owner April and Yvonne (who lives in Italy) was so Kind and friendly. I have not often meet such open and polite peopel, who spend so much work to fullfill everything i want and wish for. I hope to stay in contact with them to come back to the Villa for sure!! The pool was less than 1 minute away from our Villa and also sooo beautiful with seaview. My son loved it. Ist quiet big and sometimes we had it for our own because not many peopel used it. It was the hole time very clean and all the time secured by a very friendly liefguard. The beaches are very nice. There is one beach to the next and from the Villa you Need maybe 10 minutes by car. You can decide which Kind of beaches you like from sandy beaches to Stone beaches. We loved it and spend a lot of time there. For daily life you can find everything in the Close City "Belvedere": Supermarket, Restaurants, Shops, whatever you Need or want. We loved this Holidays and wish to come back soo soon. Thank you my dear April again for everything. I hope we stay in contact!! We had a relaxing week in Casa Rossa, April was most helpful and easy to communicate with prior to commencing our holiday. When we arrived, it's a little difficult to find, but, Yvonne was on hand to assist and the welcome pack meant a well stocked fridge. The villa is large with high ceilings. The views from the villa are spectacular and the weather was mixed during our stay, but always hot (the A/C was very welcome at night). The pool was large and very clean. The pool attendant was in attendance throughout the mornings of our stay and was very entertaining. Great fun. There are several very nice beaches locally, just a short drive from the villa. 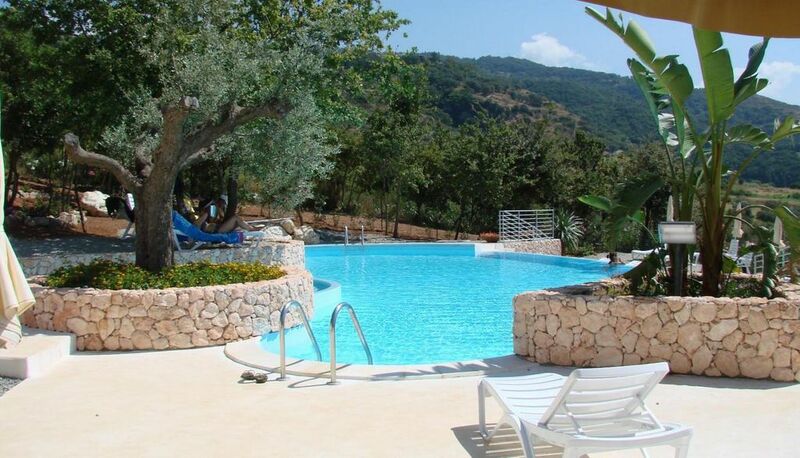 Good local facilities, supermarkets, cafes, restaurants and quaint Italian villages in the hills. We had a great week in Casa Rossa, April and Scott could not have been more helpful before we arrived and everything was as we'd expected. The villa is spacious with nice high ceilings giving an airy feel and there was plenty of room for our family of six. The views from the balcony along the coast were spectacular and it was baking hot throughout our stay apart from during one very dramatic storm. The shared pool was large and never busy (it turned green one day but that was quickly sorted). We found lots of lovely beaches within a short - and some great restaurants, especially along the coast to the north and up in the hills behind the house. Recommended. We had a lovely stay, in this wonderful big house. The view and surrounding area is beautiful, and there are several good beaches close by, which are easy to access by car. We were greeted with a very nice welcome basket containing lots of great food, so we had a lovely dinner our first night. For the rest of the trip a nearby Lidl was very handy. We were seven persons staying in the villa two of us were small children so it was fantastic to come home every afternoon for a swim in the pool and then make dinner that we had on the terass with a beautiful view over the sea. April (owner) and Yvonne (our contact in Italy) helped us a lot with all our questions and we felt very welcome. A bela vila de Cittadella Del Capo tem as praias mais próximas, 'La Torre e Sunbeach' - apenas a 5 minutos de carro. Como a vila está localizada mesmo na costa, há outras infinitas praias e marinas acessíveis, tudo a uma curta distância de carro com belas aldeias, cidades ao longo do caminho, incluindo; Cetraro, Belvedere, Scalea, Diamante, Amantea, Cosenza, (ambas pequenas cidades) Falerna Marina, Praia a Mare (Aquapark ao ar livre está localizado nas proximidades). Há uma série de opções de viagem para você ao reservar as suas férias de sonho no número 9 Cassa Rosse: Lamezia Terme está localizado a 50 milhas de distância ou a pouco mais de uma hora de carro. Família amigável vôos diretos do Reino Unido com a Ryanair / disponível a partir de abril a outubro de STN / também voando TUI de East Midlands direto para Lamezia Terme de abril a outubro de 2019. Nota - Isso coincide com a mudança ao longo dos dias. Voos indiretos para Lamezia via Roma, Milão e Pisa com Alitalia, BA, Easyjet, Air One ou Meridiana. Voos para Nápoles com Easyjet ou BA e, em seguida, 3 horas de carro ao sul da vila. A aldeia e a praia mais próximas, Cittadella Del Capo está localizada a apenas cinco minutos de carro ou 15 minutos a pé numa colina relativamente íngreme. Outros resorts populares incluem: Belvedere Marittimo 5 milhas. Diamante 11 milhas. Paola 17 milhas, Scalea 18 milhas. A bela Praia a Mare tem um Aquapark e tem 25 milhas, enquanto a Cosenza, fabulosa para fazer compras, fica a 35 milhas ou a 1 hora de carro. Alternativamente, Nápoles fica a 160 milhas ou Roma 280 milhas. A villa fica mesmo à saída da principal estrada costeira (SS18). Esta estrada pitoresca, relativamente reta, o levará até o norte como Maratea ou Sul para Tropea e em frente para Reggio di Calabria. Uma vez que você está acostumado a dirigir na Itália, você achará bastante fácil encontrar seu caminho, especialmente quando estiver usando o SS18. O supermercado mais próximo (Vivo) pode ser encontrado apenas a 5 minutos de carro da villa, indo para o norte em direção ao Belvedere, no lado esquerdo da estrada. Aqui você encontrará uma grande variedade de produtos a preços muito razoáveis. O cédulo mais próximo e o Cafe Bar também estão localizados antes da Vivo à direita junto com Hotel e Restaurante. Há também hipermercados maiores (Il Tirenno, IperSpa) encontrados ao longo da SS18, apenas fora de Belvedere (15 minutos de carro). Você pode escolher dirigir o sul para Cetraro, (10 minutos de carro) ou Norte para Belvedere e Diamante, (15 a 20 minutos de carro). Ambos os quais oferecem ótimas opções em compras, restaurantes, cafés, bares e passeios costeiros. Belvedere e Diamante são os maiores, mas nós lhe damos um guia muito informativo sobre o que fazer em e ao redor de Calábria à chegada à villa. Há um mercado fantástico em Belvedere no qua, Cetraro em Qui e Diamante no Fri. Estes geralmente começam no início da manhã e terminam por volta da 1 da tarde (Calabres gosta de tomar um Siesta de 1 a 4 da tarde e você encontrará a maioria dos lugares serão fechados durante esses horários, exceto em agosto na alta temporada). Porto de Cemraro / Marina / Porto 3 km. Centro de bem-estar Luigiane Spa 8 km. Le 5 mins drive. 2 km. Calabria Costa do Norte Surf e esportes aquáticos. Popular ao longo da costa. "Acquaviva Hot Pools Park e de interesse histórico 19 km. História religiosa Convento di-San Francesco de Paulo. Belvedere não é muito longe, passeios praias de sorvete Parlamentos caminhadas preguiçosas ao sol, várias outras praias Promenadas ao longo da costa, você pode fazer o mínimo ou tanto quanto você deseja fazer, "o tempo fica parado" absorvendo belos raios enquanto Você explora ou relaxa, escolhe? Booking Notes: To secure a booking a non refundable deposit of 250.00 Euro is payable by bank transfer. The full balance is due 8 weeks prior to departure on arrival Euros 250. Damages Deposit together with Standard 70 Euros Cleaning Charge payable to Agent Yvonne. Damages Deposit Refundable on Departure again Standard. by Yvonne. Longer Bookings of 16 days onwards will be considered for discount to be discussed. Also Bank Holidays etc. Changeover Day: Flexible. Where ever possible we will try to accommodate your requirements, to help you enjoy your stay. Note to enable the cleaning and preparation of the villa Checkout time will be no later than 11.00am on day of departure. Other arrangements discusse Notes on prices: Special offer! Discounts are available for longer periods of rental on request please do not hesitate to ask when enquiring. alternatively discussions on "Special Prices" will be considered always. Particularly on longer bookings if required. Bank Holidays Festival Times "Easter" etc. and UK and Overseas Bank or School Holidays too.There is a generous 10 per cent Discount available for all Clients who confirm a definate Booking before 31st. December 2017 deducted on payment for Season.